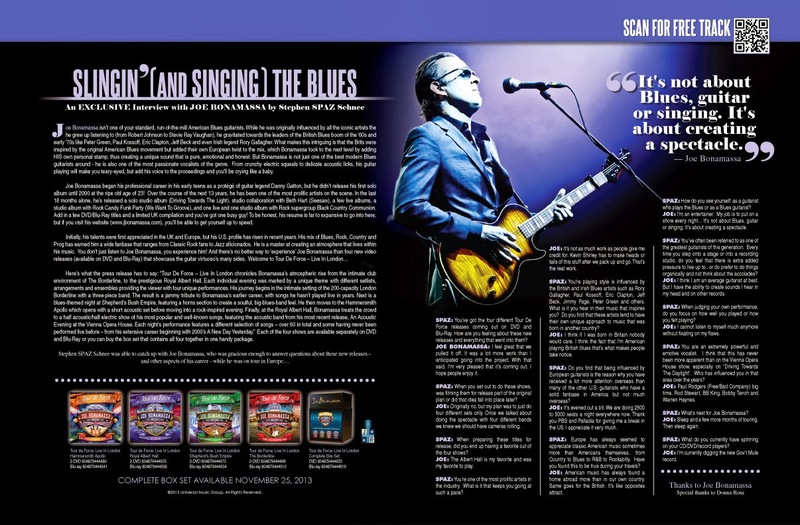 Discussions Magazine Music Blog: An EXCLUSIVE Interview with JOE BONAMASSA + FREE Download! An EXCLUSIVE Interview with JOE BONAMASSA + FREE Download! DOWNLOAD A FREE TRACK HERE COURTESY OF JOE BONAMASSA AND DISCUSSIONS MAGAZINE! Joe Bonamassa isn’t one of your standard, run-of-the-mill American Blues guitarists. While he was originally influenced by all the iconic artists the he grew up listening to (from Robert Johnson to Stevie Ray Vaughan), he gravitated towards the leaders of the British Blues boom of the ‘60s and early ‘70s like Peter Green, Paul Kossoff, Eric Clapton, Jeff Beck and even Irish legend Rory Gallagher. What makes this intriguing is that the Brits were inspired by the original American Blues movement but added their own European twist to the mix, which Bonamassa took to the next level by adding HIS own personal stamp, thus creating a unique sound that is pure, emotional and honest. But Bonamassa is not just one of the best modern Blues guitarists around - he is also one of the most passionate vocalists of the genre. From crunchy electric squeals to delicate acoustic licks, his guitar playing will make you teary-eyed, but add his voice to the proceedings and you’ll be crying like a baby. Joe Bonamassa began his professional career in his early teens as a protégé of guitar legend Danny Gatton, but he didn’t release his first solo album until 2000 at the ripe old age of 23! Over the course of the next 13 years, he has been one of the most prolific artists on the scene. In the last 18 months alone, he’s released a solo studio album (Driving Towards The Light), studio collaboration with Beth Hart (Seesaw), a few live albums, a studio album with Rock Candy Funk Party (We Want To Groove), and one live and one studio album with Rock supergroup Black Country Communion. Add in a few DVD/Blu-Ray titles and a limited UK compilation and you’ve got one busy guy! 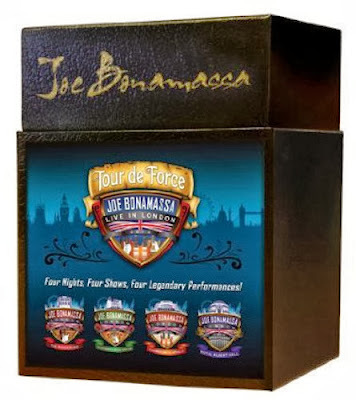 To be honest, his resume is far to expansive to go into here, but if you visit his website (www.jbonamassa.com), you’ll be able to get yourself up to speed. 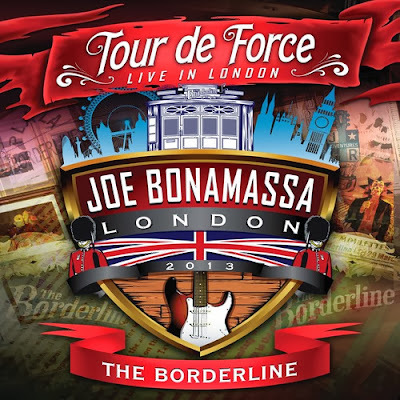 Here’s what the press release has to say: “Tour De Force – Live In London chronicles Bonamassa’s atmospheric rise from the intimate club environment of The Borderline, to the prestigious Royal Albert Hall. Each individual evening was marked by a unique theme with different setlists, arrangements and ensembles providing the viewer with four unique performances. His journey begins in the intimate setting of the 200-capacity London Borderline with a three-piece band. The result is a jammy tribute to Bonamassa’s earlier career, with songs he hasn’t played live in years. Next is a blues-themed night at Shepherd’s Bush Empire, featuring a horns section to create a soulful, big-blues-band feel. He then moves to the Hammersmith Apollo which opens with a short acoustic set before moving into a rock-inspired evening. 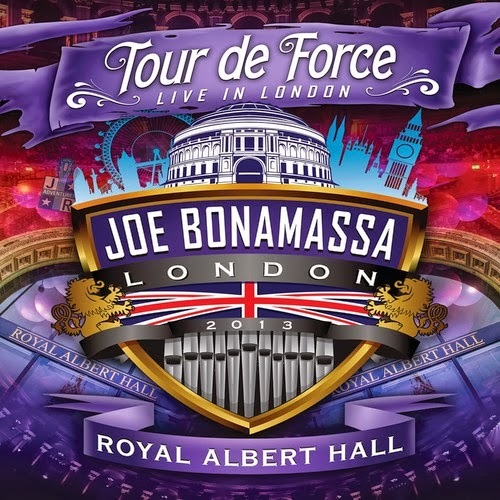 Finally, at the Royal Albert Hall, Bonamassa treats the crowd to a half acoustic/half electric show of his most popular and well-known songs, featuring the acoustic band from his most recent release, An Acoustic Evening at the Vienna Opera House. Each night's performance features a different selection of songs – over 60 in total and some having never been performed live before – from his extensive career beginning with 2000’s A New Day Yesterday.” Each of the four shows are available separately on DVD and Blu-Ray or you can buy the box set that contains all four together in one handy package. SPAZ: You’ve got the four different Tour De Force releases coming out on DVD and Blu-Ray. How are you feeling about these new releases and everything that went into them? JOE BONAMASSA: I feel great that we pulled it off. It was a lot more work than I anticipated going into the project. With that said, I'm very pleased that it's coming out. I hope people enjoy it. SPAZ: When you set out to do these shows, was filming them for release part of the original plan or did that idea fall into place later? JOE: Originally no, but my plan was to just do four different sets only. Once we talked about doing the spectacle with four different bands we knew we should have cameras rolling. SPAZ: When preparing these titles for release, did you end up having a favorite out of the four shows? JOE: The Albert Hall is my favorite and was my favorite to play. SPAZ: You’re one of the most prolific artists in the industry. What is it that keeps you going at such a pace? JOE: It's not as much work as people give me credit for. Kevin Shirley has to make heads or tails of this stuff after we pack up and go. That's the real work. SPAZ: You're playing style is influenced by the British and Irish Blues artists such as Rory Gallagher, Paul Kossoff, Eric Clapton, Jeff Beck, Jimmy Page, Peter Green and others. What is it you hear in their music that inspires you? Do you find that these artists tend to have their own unique approach to music that was born in another country? JOE: I think if I was born in Britain nobody would care. I think the fact that I'm American playing British blues that's what makes people take notice. SPAZ: Do you find that being influenced by European guitarists is the reason why you have received a lot more attention overseas than many of the other U.S. guitarists who have a solid fanbase in America but not much overseas? JOE: It's evened out a bit. We are doing 2500 to 5000 seats a night everywhere now. Thank you PBS and Palladia for giving me a break in the US. I appreciate it very much. SPAZ: Europe has always seemed to appreciate classic American music sometimes more than Americans themselves.. from Country to Blues to R&B to Rockabilly. Have you found this to be true during your travels? JOE: American music has always found a home abroad more than in our own country. Same goes for the British. It's like opposites attract. SPAZ: How do you see yourself: as a guitarist who plays the Blues or as a Blues guitarist? JOE: I'm an entertainer. My job is to put on a show every night... It's not about Blues, guitar or singing. It's about creating a spectacle. SPAZ: You’ve often been referred to as one of the greatest guitarists of this generation. Every time you step onto a stage or into a recording studio, do you feel that there is extra added pressure to live up to.. or do prefer to do things organically and not think about the accolades? JOE: I think I am an average guitarist at best. But I have the ability to create sounds I hear in my head and on other records. SPAZ: When judging your own performance, do you focus on how well you played or how you felt playing? JOE: I cannot listen to myself much anymore without fixating on my flaws. SPAZ: You are an extremely powerful and emotive vocalist. I think that this has never been more apparent than on the Vienna Opera House show, especially on “Driving Towards The Daylight”. Who has influenced you in that area over the years? JOE: Paul Rodgers (Free/Bad Company) big time, Rod Stewart, BB King, Bobby Tench and Warren Haynes. SPAZ: What’s next for Joe Bonamassa? JOE: Sleep and a few more months of touring. Then sleep again. SPAZ: What do you currently have spinning on your CD/DVD/record players? JOE: I'm currently digging the new Gov’t Mule record.